Just the other night I was sitting in the den with the kids and had an urge for something special. I don’t know about you but I love pickled food! I have eaten pickled okra, pickled asparagus, pickled bell peppers and my favorite; pickled green beans (AKA: Dilly Beans). 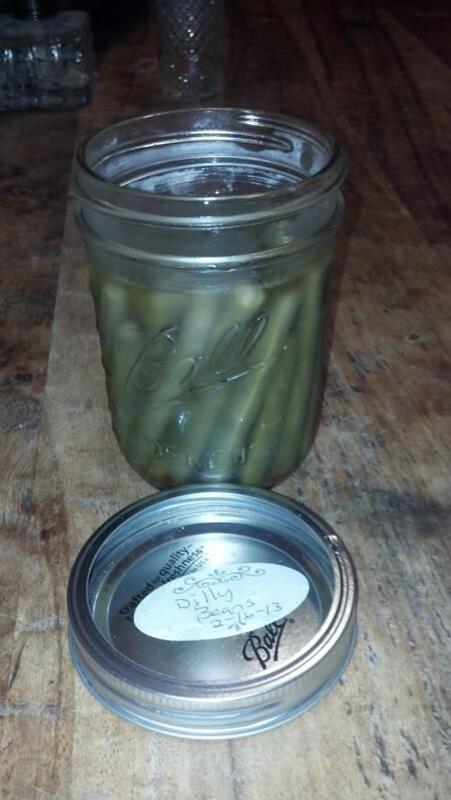 I snuck over to the pantry and grabbed a pint jar of dilly beans, which my wife and I canned about two months ago, and sat down at the kitchen table hoping the kids would not smell them. I barely started enjoying those crunchy pickled green beans before the kids came to investigate. I ended up having to fight off the kids to get my equal portion of beans. Of course my equal portion is larger than the kids portion, I mean that is only fair right? For those of you that do not have the Ball Blue Book I will share with you the recipe so you and your family can also enjoy this delicious treat. If you are just starting out in canning, I would strongly recommend that you get a copy of the Blue Book, it is very helpful! Heat jars and lids in simmering water until ready to use, pack beans lengthwise into hot jars, leaving ¼ inch head space. To each pint, add ¼ tsp. cayenne pepper, 1 clove garlic and 1 head dill. Combine remaining ingredients in a large sauce pot. Bring to a boil. Pour hot liquid over beans, leaving ¼ inch head space. Remove air bubbles. Wipe rims with damp cloth and adjust caps. Process pints for 10 minutes in boiling water bath. Check lids for seal after 24 hours. Yields – 4 pints. Usually any low acid foods like beans need to be processed in a pressure canning for safety, however when you are pickling, water bath processing is the recommended method. This is a very easy recipe and takes very little time to make such a yummy treat. Give it a try and happy canning! What Kind of Prepper Are You? What Type of Guns does a Prepper Need?